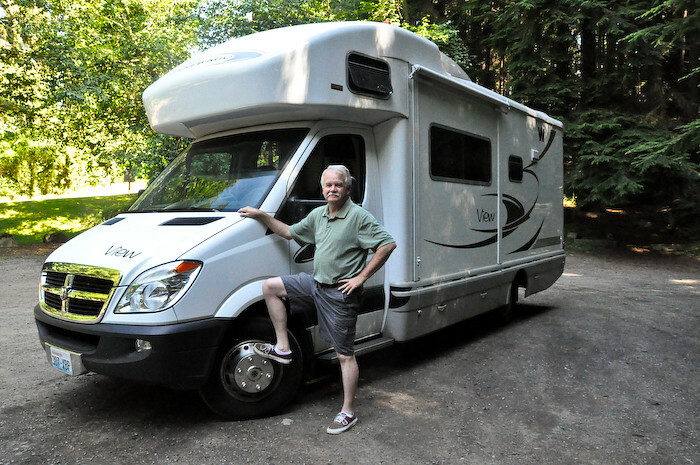 If you’ve been RVing for even a short time and use the Internet, you’ve heard of Chuck Woodbury and his conglomeration of websites and blogs devoted to RVing. If you subscribe to his main website, RVTravel.com, you have also found out that he is one of the original bloggers – even before there were blogs (weblogs, to be accurate). Back then they were called newsletters and were printed on paper and mailed out to subscribers via the US Postal Service. Being an independent businessman with a wanderlust for the open road and simultaneously making a living was not easy then, and even with the advent of the Internet, digital photography, cell phones, and wireless (none of which was widespread yet) it still is not easy. However, Chuck persisted, and though he did not get rich, he enriched the lives of countless RVers who followed his lead, wandering America’s back roads and scenic byways. But it was hard for Chuck to sit behind a desk, operating his expanding network of blogs and websites, so periodically he would disappear back into the network of his beloved blue highways behind the wheel of his motorhome. And now he is off again, at last report somewhere in Western Montana, headed East – not for a destination – but for the trip. But his RV Travel newsletter continues to come out every Saturday morning, produced by a competent and hard-working staff back in Edmonds, Washington, and a scattered collection of writers (myself included) who contribute those articles that have enabled Chuck to publish the 698th consecutive issue of RV Travel – the digital version of his original newsletter. Thanks to Chuck, his staff, and the writers you will not miss any of the weekly posts on fire safety by Mac McCoy, the fix it advice from the RV Doctor Gary Bunzer, Mark Polk’s RV Tech Tips, recipes from the RV Kitchen by Janet Groene, and the latest news, RV accessories, campground information, and everything else that affects RVers and the RV Lifestyle keeping them informed, amused, and entertained. And of course, you can read Chuck’s weekly commentary on his travels, wherever they may take him, on whatever he might discover, and to eavesdrop on his conversations with the people he meets along the way. Take a look at today’s issue #698 or sign up for a free subscription here. You’ll be glad you did.